The traditional cuisines of Goa are known as Goan cuisine. Read about Goa cuisine and its local food. 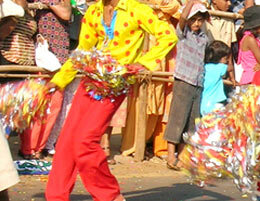 Goa not only has a varied culture but also a diverse cuisine. The famous cuisine of Goa is a must try for all those who are traveling to this wonderful place. 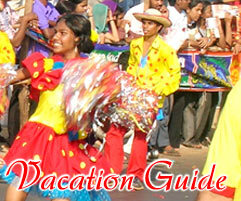 Many people tend to limit the Goan cuisines to rice, fish and curry. Agreed, that is the traditional food of Goa and makes the daily meal of a happy Goan. But the local food of Goa goes beyond just rice, fish and curry. The cuisine of Goa is sure to leave your taste buds asking for more and there is definitely a lot to choose from. The variety in Goan cuisine is due to the fact that this place has been ruled over centuries by the Mughals, Hindu rulers, Portuguese, etc. who have really left a permanent mark on the traditional style of Goan cooking and have given it an exotic edge. One of the most famous cuisines of Goa is the Ambot-tik. It is an exotic sweet and sour dish made of fish. 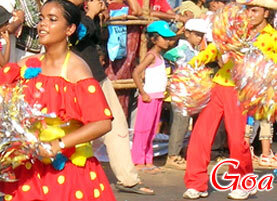 Goa is famous for its sea food which is eaten and relished by people almost religiously! A die hard non-vegetarian will have the time of his life relishing sea food in Goa. Another traditional Goan snack would be Pao com Chouricos which is basically fried Goan sausage, sautéed with onions and served with bread. The typical Portugal style of soaking meat in a concoction of spices before cooking has been adopted as the typical Goan style of meat preparation. Yet another very famous and delicious local food of Goa is the Pork Vindaloo in which pork is cooked in spicy and oily gravy. They say if you taste the Pork Vindaloo once, you won't like any other pork preparation! One can also find many common dishes like prawns, chicken, beef, etc. in Goa. Almost every other Goan dish uses rice, fish or curry in the preparation of a traditional food item. Coconut is also an important ingredient in Goan cuisine. Many dishes use coconut milk to give it a different aroma and an exotic flavor. The traditional Goan cuisine is not for those with a weak digestion though. The food is quite pungent and spicy and you don't want your stomach to grumble after indulging sinful gluttony! Goa truly offers a palatable cuisine which should be tried at all costs. The best places to try local Goan cuisines are those small roadside restaurants. They may not have the looks of a grand five star hotel but they sure provide services that will win your heart over. You can expect the warmest people to provide you with every comfort they can afford. The food is prepared with generous doses of love and devotion. So make sure you try the traditional Goan cuisine that is sure to add spice to your vacation in Goa.